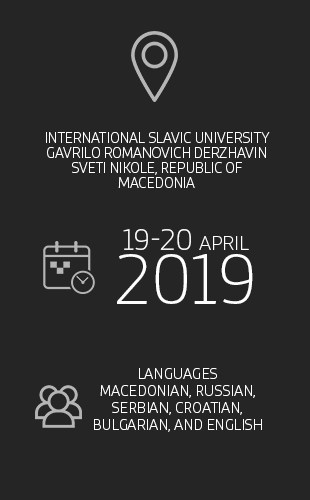 The International Scientific Conference “International Dialogue: East-West” is jointly organized by the International Slavic University “G. R. Derzhavin” – Sveti Nikole • Bitola and the Tambov State University “G. R. Derzhavin” from Russia. By organizing this conference, we aim to jointly contribute to the development of the scientific thought, to inspire an exchange of ideas and experiences between the countries participating in the conference, and to empower and motivate scientific research activities. Until now, on the conference “International Dialogue: East-West” were presented many scientific papers by authors from Macedonia, Russia, Serbia, Bulgaria, Belarus, Uzbekistan, Kyrgyzstan, Kazakhstan and more, which confirms the international nature of this conference. All scientific papers are published in the Scientific Journal “International Dialogue: East-West” (ISSN print: 1857-9299 and ISSN online: 1857-9302) published by the official publishing house of the University, the International Centre for Slavic education – Sveti Nikole. The journal is indexed in the EbscoHost database.